The 2013 winners of the coveted Asia-Pacific Incentives & Meetings Expo (AIME) Awards have been announced, recognising excellence in stand design and presentation, and acknowledging Roslyn McLeod of Arinex for her significant contribution to the industry. Craig Moyes, portfolio director for Reed Travel Exhibitions (centre) and Karen Bolinger, CEO of the Melbourne Convention Bureau (left), presented Roslyn McLeod, managing director of Arinex with the Industry Person of the Year Award at the AIME CEO Summit yesterday. While presenting the award, Craig Moyes acknowledged McLeod’s position as an international leader in the field of business events and praised her contribution to the industry in Australia. “Roslyn McLeod was one of Australia’s first professional conference organisers when she established Tour Hosts, and as managing rirector of the company now branded Arinex, she remains a key player in the industry,” said Moyes. Other awards presented this year included Best Stand over and under 36m², Best New Exhibitor Stand and Best Environmentally Sustainable Stand, as well as a new award for Best Innovative Stand. Adi Ben-Nesher, managing director of Event Skills, judged the best innovative stand and was looking for exhibitors that included originality, efficiency and effective use of space. 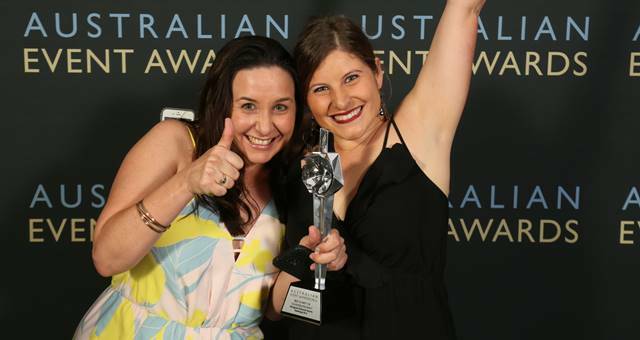 The winner of the inaugural award was Business Events Sunshine Coast. “Business Events Sunshine Coast really created engagement and interaction with their effective use of the space. It felt intimate and visually appealing, they really used the area in a smart way,” Ben-Nesher said. The Spicers Retreats Hotels & Lodges team with their award. The Best Stand 36m² and Under was awarded to Spicers Retreats Hotels & Lodges for taking the concept of luxury hotels to the next level with a visually exciting stand and a team who committed to the theme by dressing in luxe bathrobes. India Tourism took out the Best Stand Over 36m² Award, recognised for creating a welcoming and eye-catching display that captured the essence of the country and product. Best New Exhibitor Stand went to City of Sydney for their bright and impressive backdrop which stood out from the competition as well as the overall atmosphere of the stand inviting visitors to engage with the highly professional team. AIME also recognised exhibitors who have gone the extra mile to make their stand environmentally friendly. For the second year in a row, the award for Best Environmentally Sustainable Stand was presented to Accor Asia-Pacific for their efforts in creating a stand with limited impact on the environment. The materials on the stand are 100 per cent reusable and its flooring system has a lifespan of 10 years or more, with a certified structural base from Good Environmental Choice Australia (GECA). AIME was held on 26-27 February at the Melbourne Convention and Exhibition Centre (MCEC). Some of Sydney's biggest players have taken out Restaurant and Catering awards for 2013.